So first off, you’re probably wondering why not just buy one of those pre-packaged boxes of veggie burgers rather than go to all the trouble of making your own. The answer is simple – pre-packaged means ‘processed’ – and also means full of mysterious ingredients you probably shouldn’t be eating – namely fat. Let’s look at the ingredients for two of the more popular ‘Veggie Burger’ brands out there in stores. The highlights in red are mine for emphasis. They may just surprise you. Ingredients: WATER,SOY PROTEIN CONCENTRATE,REDUCED FAT CHEDDAR CHEESE (PASTEURIZED PART-SKIM MILK, CHEESE CULTURE, SALT, ENZYMES, ANNATTO (COLOR), VITAMIN A PALMITATE), WHEAT GLUTEN, CORN OIL, CONTAINS LESS THAN 2% OF METHYLCELLULOSE, HYDROLYZED CORN PROTEIN, WHEAT GLUTEN AND SOY PROTEIN, SALT, CARAMEL COLOR, CHEESE POWDER (CHEDDAR CHEESE (MILK, CHEESE CULTURE, SALT, ENZYMES), CREAM, SALT, SODIUM PHOSPHATE, LACTIC ACID), DRIED ONIONS, YEAST EXTRACT, NATURAL FLAVOR (NON-MEAT), SESAME OIL, DISODIUM GUANYLATE, DISODIUM INOSINATE, BROWNED IN CORN OIL. Ingredients: TEXTURED VEGETABLE PROTEIN (WHEAT GLUTEN, SOY PROTEIN CONCENTRATE, WATER FOR HYDRATION), EGG WHITES, CORN OIL, CALCIUM CASEINATE, CONTAINS TWO PERCENT OR LESS OF MODIFIED TAPIOCA STARCH, ONION POWDER, CANOLA OIL, TRIGLYCERIDES FROM COCONUT OIL, HYDROLYZED VEGETABLE PROTEIN (CORN GLUTEN, WHEAT GLUTEN, SOY PROTEIN), DEXTROSE, SALT, SOY PROTEIN ISOLATE, AUTOLYZED YEAST EXTRACT, SUGAR, NATURAL AND ARTIFICIAL FLAVORS FROM NON-MEAT SOURCES, CARAMEL COLOR, CULTURED WHEY, MALTODEXTRIN, GARLIC POWDER, SPICE, CELLULOSE GUM, DISODIUM GUANYLATE, DISODIUM INOSINATE, SOY SAUCE (WATER, SOYBEANS, SALT, WHEAT), VITAMINS AND MINERALS (NIACINAMIDE, IRON [FERROUS SULFATE], THIAMIN MONONITRATE [VITAMIN B1], PYRIDOXINE HYDROCHLORIDE [VITAMIN B6], RIBOFLAVIN [VITAMIN B2], VITAMIN B12), SESAME SEED OIL, CELERY EXTRACT, SOY LECITHIN. If you’ve ever had either of these burgers, you may have noticed how ‘greasy’ they are for a Veggie Burger. Well it’s no wonder. Over 1/3 of their calories are from fat. And both brands contain Saturated Fat and Soy Protein Concentrates – what many medical experts today are telling us to stay away from. See that Autolyzed Yeast Extract? That’s just another name for MSG, and let’s not forget they both contain dairy and/or eggs. Not very Vegan after all are they – or healthy. No meat, no fat, no cholesterol, no dairy, no eggs, no weird science project chemicals – just whole foods – and they happen to be plant-based too. Beans: Jeff recommends Kidney Beans to get the right texture. I know a lot of people on the net have used different kinds of beans – so all I can say is experiment. Be sure to rinse and drain thoroughly. Rice: Cooked Brown Rice is what is called for in the recipe. I use Uncle Ben’s Boil in Bag when I want quick and easy. Oatmeal: Regular Old Fashioned Rolled Oats from Quaker. Don’t use any of the instant oatmeal stuff, or steel-cut, just oats. And don’t cook it – just add it in dry. Tomato Sauce: Actually you can use any kind of tomato(y) sauce you have on hand, Ketchup, Salsa, whatever. I have also used leftover Marinara Sauce which turned out pretty well. Varying your sauce will change the flavors – so experiment! Spices: For my mix I like to use Onion Powder, Garlic Powder, and Mrs Dash with maybe a little bit of black pepper. Again – experiment! Chipolte? Go for it! Homemade vegan burgers using just four ingredients. No meat, no fat, no cholesterol, no dairy, no eggs, no weird science project chemicals – just whole foods – and they happen to be plant-based too. Recipe by Jeff Novick. Rinse and drain the beans thoroughly and then place them in a large bowl. Mash them well until you almost got refried beans. It’s ok to leave some chunks in. Add the oatmeal, rice, sauce, and spices. Make sure your hands are clean and dig in – mix and squeeze. Just like mom used to make her meatloaf. Once mixed well – form and shape into patties. Important! Place the burgers on a plate in the fridge and forget about them for at least 20 minutes. This allows them to set up and get firm. Grill both sides (5 min or so) to get those lovely grill marks.... Remember the longer you grill them the harder and drier they become. We don't want any hockey pucks! 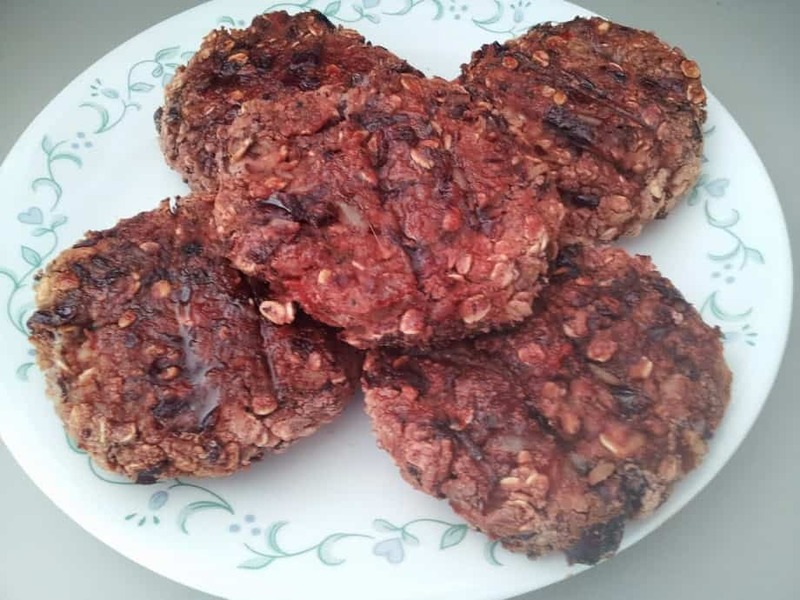 I like my burgers on a grill but they can also be baked or pan seared in a non-stick pan. For grilling I baste mine with either a BBQ or Teriyaki Sauce for extra flavor. Be careful turning as these to have the tendency to break apart. Remember there’s not all that fat and gristle to hold them together. Depending on your grill and distance from the heat - grill 10 minutes or so on each side or until done. Now all that’s left is to dress them up with lots of veggies and the condiments of your choice. Made this for the first time. Turned out pretty well. Little crumby, but I’ll probably learn over time. Made sure to cook up some home fries too — salt & oil free, of course. It all hit the spot. Badly needed right in the midst of BBQ season..
Veggie Kabobs are also awesome on the grill. Big chunks of bell pepper, onion, cherry tomatoes, mushrooms, potato, and pineapple with the BBQ sauce of your choice – good stuff. Aren’t they? And so much better (and healthier) than any of the soy based Boca or Morningstars. Glad you liked them! I stopped using Quaker products some time ago. Read about the connection between ROUND-UP and Quaker. Using it on the crop. Now using an organic Oats. I saw your post and photo over on the McDougall forum. Your photos are so yummy looking that I couldn’t help but want to try and make this. It turned out great! Thanks for posting! I look forward to trying more of your recipes! Awesome! Glad you liked them! These are also the base for my Hippie Loaf as well. Good stuff. I’m going to add some egg substitute for binding. 1 tbsp ground flax mixed with 3 tbsp water & let sit for 10 min then add to mix. How long and how hot do you cook them if you bake them in the oven? I have never baked them so you’ll have to experiment. I just thawed some that I had frozen some time ago, and literally flopped one in a dry skillet and dry fried it for about a minute or two each side until it started to brown. Delicious. I’ve made these a couple times now! Thanks so much for sharing the recipe. Another great way to have them is like a Salisbury steak slathered in mushroom gravy side of greens! So good!! My cheese sauce is amazingly gooey! And I use it on everything! Tried these with one can of cannelli and one can of butter beans. Then used salsa instead of tomato sauce. Throw it in a pita pocket with lettuce and tomato and your sauce of choice. Unbelievably delicious! That DOES sound good! Thanks Kristina! Jeff Novick does so much for the WFPB community and has dozens of great free resources, but I’m not sure that this is one of them. I got my bean burger recipe by purchasing one of his DVDs. I hope you checked with him before posting his recipe for free. I assure you it is ok. In fact, when I posted this last year on the McDougall Forum, Jeff made a comment on how famous he was becoming. As you said, many of his recipes are available for free on his Facebook Page. It’s cool – but thanks for your concern. A teaspoon of smoke flavor adds a nice touch. Do you cook the oats first? Hey Chuck what if you add some flax egg (flax seed and water) to hold them together better, what do you think? 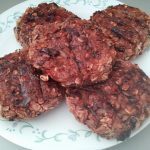 New at this – Made the burgers tonight, Added cumin seed to mix. I also cooked some mushrooms and thinly sliced onions together with some tamari. for the top. Trying to cook for a spouse who loves meat. Thank you for the recipe. I guess it’s been awhile since anyone has posted here. I just wanted to say that I tried these burgers for dinner tonight. I used one cannelli and one can kidney beans. It came out great, my husband and I both really liked them! Lots of variations possible, will be making these again! THANK YOU for sharing the recipe!!! How long and at what temp would they be baked for? Boca Burgers don’t have cheese in them. The ones I checked that label on do. Made these tonight; only my second veggie burger ever, although I’ve been WFPB for a couple of years. They turned out great, and not a bit crumbly. I used home-cooked kidney beans. Tweaking the recipe some, as we lle chewy burgers. I’m upping the rice and decreasing the beans. Had to press them onto waxed paper with a piece of waxed paper to cover my hand, but they are in the oven now. Thanks so much for all of your amazing recipes, Chuck!! Because my wife has rheumatoid arthritis and can’t eat fat, we use rye flakes in place of oat flakes which we like as well, if not better. So happy that they stayed together while cooking and eating! But..the leftovers fell apart. Any ideas on how to prevent that?